Enjoy winter by making memories on the blankets of snow covered hills with the Frontier 6ft Toboggan with Plaid Pad by Streamridge<sup></sup>. This toboggan will be an all-time favourite as it gets passed down through generations of your family. Handcrafted from Ontario ash hardwood, it is 100% screwed together (no weak staples) making it strong to withstand many days of downhill rides. A steam-bent technique is used to achieve the quality and traditional style of a toboggan. A chain holds down the hood of the toboggan. A water-based, eco-friendly finish protects the wood year after year. The premium braided pull rope is easy on the hands and makes the trip up hill easier as well. An eye-catching plaid pad delivers maximum comfort and helps you ride in style. Hand-sewn from tough, 600 denier water resistant polyester. Attaches easily with strong, double-stitched tie straps. Share the winter fun! Give your children a unique handcrafted sleigh. Built with Ontario ash hardwood, the Alpine Kinder Sleigh with belted plaid pad is perfect for your child. Steam-bent hoop for back support. Moulded polypropylene cutter-style runners give the sleigh a classic look and glide through the snow. Hand-sewn, plaid pad adds comfort. Made from tough, 600 denier polyester. Attaches easily with strong, double-stitched tie straps. Adjustable support belt keeps your child buckled in, and prevents them from climbing up or falling out. Tough, eco-friendly protective finish. Make lots of memories on this stylish sleigh for years to come. This Grizzly Kinder Sleigh with Bootie Pad by Streamridge<sup></sup> makes the perfect giftfor child and parent! Going for a sleigh ride is the perfect activity to spend quality time with your young ones. Designed to last for decades of outdoor use. Handcrafted from Ontario ash hardwood. High-quality braided pull rope thats soft on your hands. Steam-bent manufacturing technique creates the classic look of the curled runners. Red, metal c-clip protects the runners and helps them retain their shape. Slice through the snow better than ever with the added flat metal wear bars underneath the wooden runners. Hand-sewn, 600 denier polyester, plaid pad adds comfort to every ride. Attaches easily with strong, double-stitched tie straps. Hand-quilted bootie keeps your child extra warm and cozy while out in the snow. The Grizzly Kinder Sleigh with Glowing Plaid Pad by Streamridge<sup></sup> is handcrafted from Ontario ash hardwood. Classic curled runners are achieved with a steam-bent technique. Red, metal c-clip protects the runners and helps them retain their shape. Premium, braided pull rope is soft on your hands. Metal wear bars under the wooden runners extend life of your sleigh and improve tracking and pulling. Hand-sewn, 600 denier polyester, plaid pad adds maximum comfort during the ride. Attaches easily with strong, double-stitched tie straps. Adjustable support belt keeps your child buckled in so they don't climb out or tumble off. You'll be easily spotted while out in the evening with the reflective strip of material that's sewn around the outside of the pad on three sides. Morning, noon or night, enjoy sleigh rides to the max this winter season with the Grizzly Kinder Sleigh with Glowing Plaid Pad by Streamridge<sup></sup>! 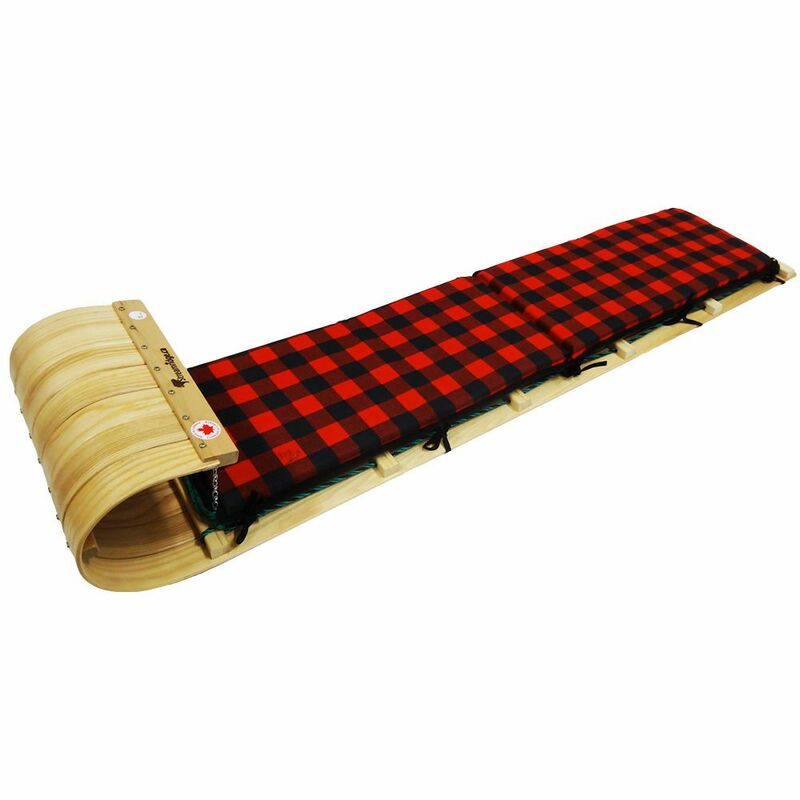 Frontier 6 Feet Toboggan with plaid pad Enjoy winter by making memories on the blankets of snow covered hills with the Frontier 6ft Toboggan with Plaid Pad by Streamridge<sup></sup>. This toboggan will be an all-time favourite as it gets passed down through generations of your family. Handcrafted from Ontario ash hardwood, it is 100% screwed together (no weak staples) making it strong to withstand many days of downhill rides. A steam-bent technique is used to achieve the quality and traditional style of a toboggan. A chain holds down the hood of the toboggan. A water-based, eco-friendly finish protects the wood year after year. The premium braided pull rope is easy on the hands and makes the trip up hill easier as well. An eye-catching plaid pad delivers maximum comfort and helps you ride in style. Hand-sewn from tough, 600 denier water resistant polyester. Attaches easily with strong, double-stitched tie straps. Share the winter fun!